I know at this time of year most of us are running around our local shopping centres trying to get presents for our loved ones and normally, we're the last ones we think about buying for. So this year, rather impatiently I decided to go against the norm and I went and ordered myself a brand new camera! I've always had an interest in photography and had been using a Nikon D40x as bought for me as a birthday gift. I thought it was about time, and with my blog in place to buy a new one. Rather than go for an SLR, I wanted a compact that basically did it all and luckily for me I found one. 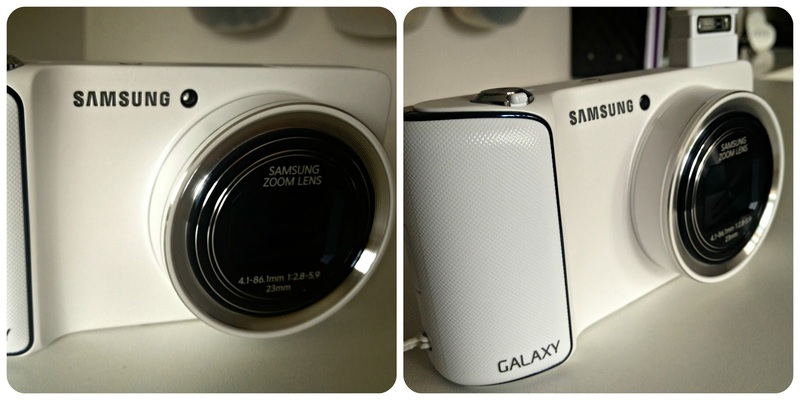 I had heard about how amazing Samsung's cameras were on mobiles, but never thought to myself about their actual cameras. I noticed a deal that Jessops were doing online, which offered the Samsung Galaxy Camera and a Samsung Tab 2 7.0 Tablet for £359. Being a try before you buy kind of girl, I decided to head to my local electronics store to check it out. I literally picked it up and fell in love. Not only was it good looking, but nice, white, new and shiny! The camera itself is 16.3 megapixel, has a 21x optical zoom and practically runs as a smart phone. It uses wi-fi so I can share photos and videos super easily. Not only that, but I can play Jelly Splash when all my lives on my mobile run out! So here's to better quality photos! Such a gorgeous and handy little camera! Can't wait to see all your photos with it!